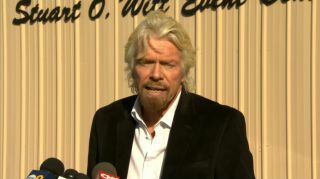 Virgin Galactic founder Sir Richard Branson makes a brief statement to media at the Mojave Air and Space Port on Nov. 1, one day after the company's SpaceShipTwo spacecraft crashed during a test flight, in this still from an NBC News webcast. One pilot died in the crash, while another was injured. The investigation into the deadly crash of Virgin Galactic's SpaceShipTwo space plane in the Mojave Desert yesterday (Oct. 31) has officially begun, with the National Transportation Safety Board taking the lead. Meanwhile, Virgin Galactic's founder Sir Richard Branson said his company will work closely with investigators to determine the cause of the accident. An NTSB Go-Team arrived in Mojave, California today (Nov. 1) to begin investigating Friday's SpaceShipTwo accident, which claimed the life one of test pilot and seriously injured another. That team consists of about 15 people, acting NTSB chairman Christopher Hart said during a brief news conference in Mojave today. The NTSB has little information to share about the crash at this point but will reveal details as the investigation goes on, he added. Virgin Galactic founder Sir Richard Branson, who flew to Mojave to be with the SpaceShipTwo team in the wake of the crash, said the company will cooperate fully with the NTSB's work. "We are determined to find out what went wrong, and we're working with the authorities to get that information," Branson said during a news conference at Mojave today. "It is too early for me to add any details of the investigation at this stage." Branson also stressed that Virgin Galactic is committed to its space-tourism mission despite Friday's tragedy. "We're going to learn from what went wrong, discover how we can improve safety and performance and then move forward together," he said. The accident occurred shortly after SpaceShipTwo took off from Mojave Air and Space Port Friday morning on its fourth rocket-powered test flight and 55th flight test of any kind. Exactly why the space plane went down is unclear. Pieces of of Virgin Galactic's SpaceShipTwo space plane are seen on the Mojave Desert floor after a deadly crash that killed one pilot and injured another on Oct. 31, 2014. The crash occurred during a rocket-powered test flight. One of the two test pilots died and the other was taken to a nearby hospital with serious injuries, authorities said. Both pilots worked for Scaled Composites, the Mojave-based firm that builds and tests SpaceShipTwo for Virgin Galactic. Their names have not been released yet. The six-passenger SpaceShipTwo is designed to be carried to an altitude of about 50,000 feet (15,000 meters) by a carrier plane called WhiteKnightTwo, at which point the space plane is dropped and its rocket engine kicks on, blasting the vehicle up to an altitude of 62 miles (100 kilometers). To date, more than 700 people have put down deposits for a seat on SpaceShipTwo, which currently costs $250,000. Branson has said he hopes to begin commercial operations sometime next year, but Friday's crash will almost certainly push that timeline back.